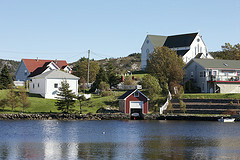 Vibrant and rich are two words that come to mind to describe the destination of Newfoundland and Labrador. This region has an incomparably vast array of experiences to immerse oneself in and enjoy. As big as Japan, and over three times the size of the Maritime Provinces, Newfoundland and Labrador is a region unique in all aspects. 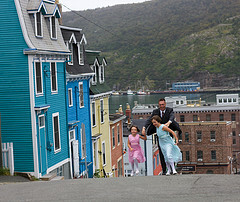 St. John,™s, the capital city happens to be closer to Greenland than to New York and nearer to Ireland than to Chicago. Not to mention, it is the oldest city in North America. The entire province covers more than 400, 000 square miles and the geography varies from barren rock to lush farmlands to verdant forests to pristine fjords. 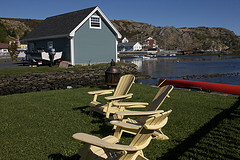 There is truly something for everyone in Newfoundland and Labrador where the natural beauty and year round effervescence of life create a sanctuary where a traveler is sure to recharge fully and connect oneself back with the earth and the natural world. Here, where life is cloaked in a snow white blanket, the temperature is often below zero and the crystal clear air is chilled, one is able to quiet the soul and find the peace and serenity the spirit craves. As if the beauty of the skyward stretching cliffs, the tireless orchestra of crashing waves, and the vibrant wildlife weren,™t enough, this mesmerizing setting also includes its very own light show. The Aurora Borealis, or the Northern Lights fills the sky with an unforgettable display of rich hues in a hypnotizing show of natural beauty at its very finest. 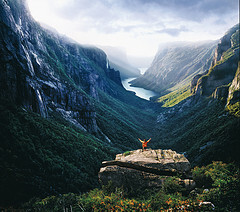 Travelers choose Newfoundland and Labrador to seek out the richness of personal space- where active opportunities abound with more than enough space in which to enjoy. 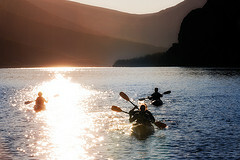 Snowmobiling and snowshoeing are only two options the sensational geography of this Newfoundland and Labrador provides. Not to mention that some of the best snow skiing between the Rockies and the Alps can be found here at Marble Mountain Ski Resort. For those that seek a less outdoorsy, atmosphere and prefer to soak in the region,™s gorgeous scenery from a more urban setting, St. John,™s is sure to cater to these needs. With wonderful gourmet restaurants as well as fabulous events and festivals, city lovers are sure to feel right at home. For hikers and/ or dedicated walkers, Newfoundland and Labrador offer literally hundreds of trails across the province, that may range from a short stroll through a park to a multi week-long trek through the wilderness. 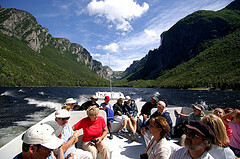 Extensive trails include the East Coast Trail, Discovery Trail, as well as Gros Morne National Park. One will never have to wander far looking for wildlife in Newfoundland and Labrador. Over 22 species of magnificent whales, porpoises and dolphins grace the shores each year, including 10,000 humpbacks that breach within clear view from the coastline. One may also view a thousand pound moose, casually grazing along roadsides and barrens. With over 700 known seabird breeding sites, Newfoundland and Labrador may be the world,™s seabird capital,. Several of these bird colonies are noted to be among the largest and most accessible on earth. The region,™s sensational geography lends itself well to being noted as the best place in the world to see icebergs. On a clear, sunny day, icebergs can be seen from many vantage points along the northern and eastern coasts. These great, silent flotillas, of every shape and size, represent colors ranging from the purest snow-white, to the deepest aquamarine. From the Northern tip of Labrador stretching to the eastern coasts of Newfoundland, is the sea of Iceberg Alley that pounds and caresses the shore. Icebergs created 10,000 years ago, on the Greenland icecap, dance along the coastline and out towards the sea, propelled capriciously by wind and tide, tumbling, twisting, and transforming into fantastic shapes before melting into the warm gulf stream waters of the of Newfoundland and Labrador’s southeast. No matter how one chooses to spend his or her Newfoundland and Labrador vacation, this region is sure to provide all the right ingredients for a fantastic getaway.